“Can you really cruise as a vegan?” I’ve had people ask me. I am not surprised though, as only recently an advice column in a popular UK cruise magazine suggested eating vegetarian or pescatarian on a cruise. 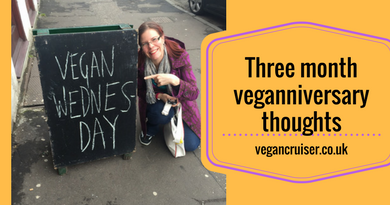 Presumably for the imagined lack of vegan choice and for failing to grasp that veganism is not a diet, but an ethical lifestyle. But fear not, vegan options exist. 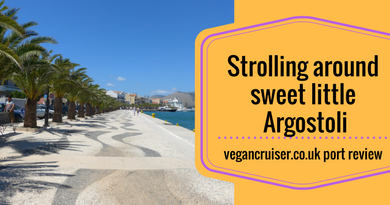 This blog is here to show that whether you are vegan, or have food allergies, cruising is a valid holiday option for you too! Before I was vegan, I was used to looking for dairy-free options or suffer the consequences for my lactose intolerance. I knew cruise dining room menus had allergen notices. I also knew the kitchen staff would cater for various needs. I had even sailed with my vegan husband while still an omnivore myself. So booking my first cruise as a vegan, I was not worried. 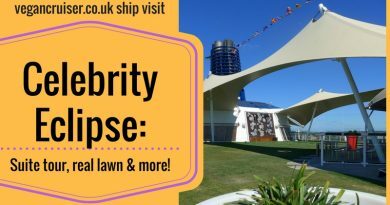 My friend (first-time cruiser) and I booked our May 2016 Royal Caribbean cruise at the start of the year and used a specialist UK cruise travel agent. This is always advisable as they are a) specialists in the field should you have any questions and b) can generally get you better fares than booking directly with the cruise line. Sometimes booking direct can be cheaper, but that will a topic for another blog post altogether. On this occasion, we missed out on a great balcony deal but our inside/interior cabin served us well. And the lack of natural light actually gave us very restful sleep indeed. This was my first time in years in an inside cabin and I have been convinced to try it again. Especially as with any saving made (in selecting inside over oceanview or balcony) I may be able to splash out of a few more excursions instead etc. Our Montenegro & Greek Islands fly-cruise from Venice with port transfers was built with regional UK flights via Amsterdam. It is always my preferred option to get a flight package with the cruise line. This in case anything goes wrong with the airline (delays, lost luggage etc) as then it is the cruise line’s responsibility to sort it out for you. Thankfully the transit in AMS was as it always is with KLM – efficient and smooth. Both us ladies and our cases made the connection fine. Upon arrival at Marco Polo Airport (AP) in Venice, we were met with loads of Royal Caribbean staff in their day-glow yellow vests and clipboards. In about 15 minutes from checking in with the terminal team, we were lead out to the transfer buses. As Marco Polo AP is expanding (building works at the terminal) this meant having a 5-10min walk to a nearby bus car park whilst pulling our cases & trolley bags with us. Not a problem for us but I can imagine elderly passengers and anyone with mobility issues would require assistance. In just over an hour from landing at Venice airport, we found ourselves at the cruise terminal. A very quick transfer indeed, one of the reasons why I love cruising from Venice. Once we got to Maritima terminal, we attached our pre-printed luggage labels onto our cases and handed them to staff for screening. No spirits or other prohibited items such as irons (fire risk) are allowed onboard so all cases get x-rayed like at airports. I must have had a brain fart leaving the house at 4 am but I had only printed out my ticket booklet and luggage labels, not the SetSail Pass form for cruise contract and any onboard charges. Thankfully, I was able to fill in some extra paperwork at the check-in desk and was onboard in no time although we had two more security checks for our carry-on bags. One was carried out by terminal security and another upon entering the ship by security staff there. This is where we, mistakenly, were pulled aside for a bottle of Prosecco in our hand luggage. Passengers are allowed to have a bottle of wine or bubbly per adult (2 max per cabin) so we were well within the limit allowed by RC. Once security staff checked with his superior we were waved on. Our deck three midship starboard (will explain later) interior cabin was already available for us, so we dropped off our trolley bags and went up to the Windjammer (buffet) for some late lunch. I was hungry as our airline has no vegan meal option on short haul flights – special meal requests are only for long-haul. Post lunch we walked around the ship to get our bearings with the layout/decks until it was time for the mandatory muster drill. We made our way to our muster station and observed staff demonstrating the use of life jackets (no, you don’t need to bring your own, thankfully) and listened to the captain’s instructions. If something does go wrong you really want to know the place to go to, surely? And as the sun set..
← Happy 3 month veganniversary to me..?